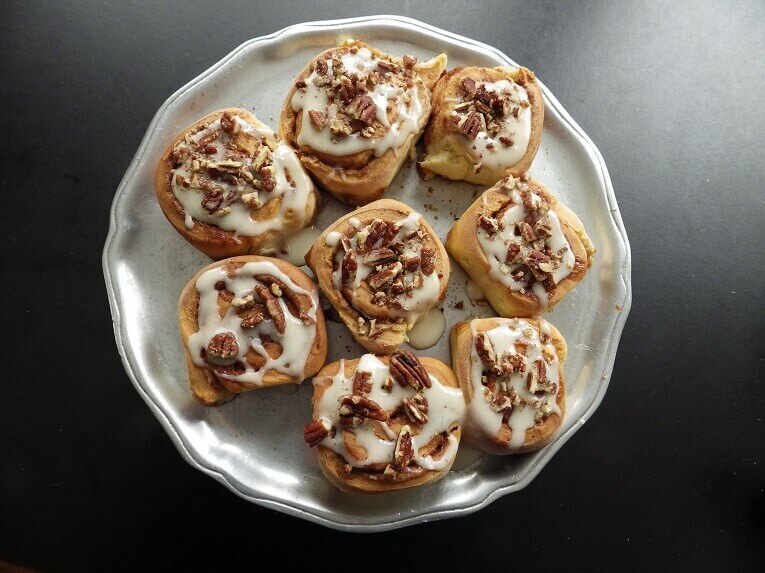 Cinnamon rolls are a classic American treat. 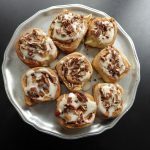 They’re buttery, sweet and the flavor of cinnamon and a powdered sugar-based glaze make this a great breakfast addition with anything, especially coffee. 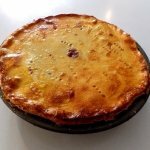 The key is to make sure the dough rises in the bread machine and then has a good, second rise on a baking sheet before baking in the oven. If you don’t allow the time for a good second rise your rolls will be chewy and tough. This is a bit of a complicated recipe, but your bread machine can make the first step easier. You use the dough setting to knead and give the dough its first rise, and then remove to a floured surface to roll out and finish the process. 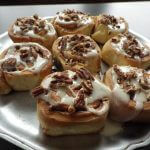 You’ll also need to make a glaze with powdered sugar, water and some other ingredients. If there’s one thing I’ve learned about making a nice, thick glaze is to be very economical with liquids at the beginning and throughout the process. If you need more water or milk, add it in drips off a spoon. If your glaze is too watery just add more powdered sugar but you’ll be surprised how much powdered sugar, you’ll need if you get the initial blend too watery. It’s best to make the glaze in a bowl using either a handheld egg-beater or in a bowl using a countertop mixer. 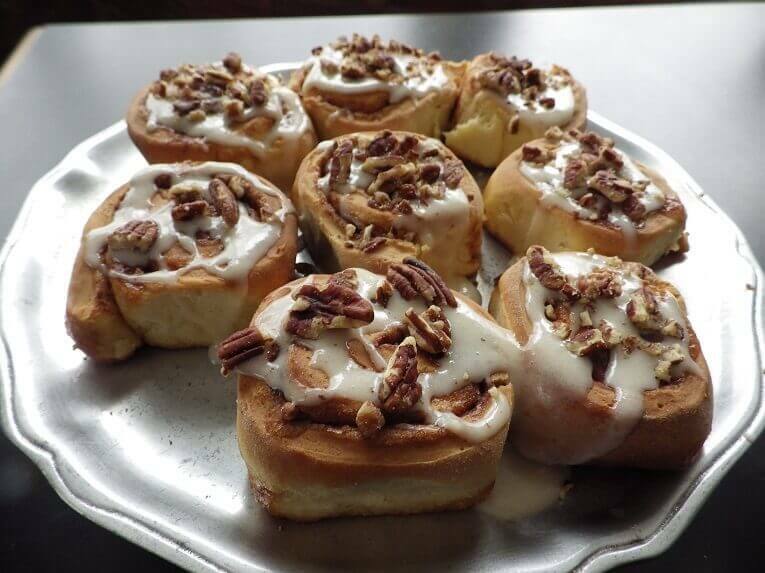 You don’t glaze until after the rolls are baked, but don’t glaze too soon or the heat of the freshly baked rolls will melt the glaze too much. 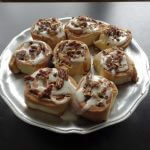 The glaze has other ingredients like butter and cream cheese. Add the ingredients to the bread pan in the order indicated in the ingredient list and select the dough setting. When the Dough cycle has finished, turn dough out onto a lightly floured surface and roll into a 17x10 inch rectangle. 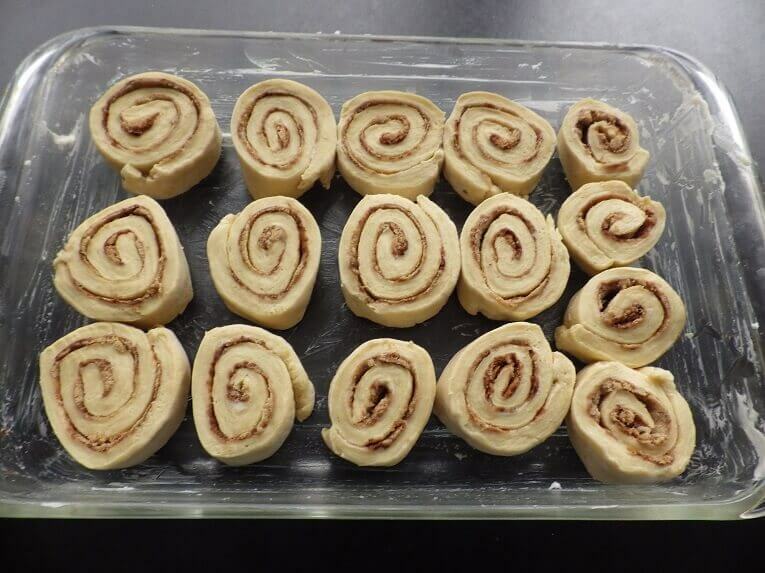 Spread the rolled out dough with 1/2 cup softened butter. 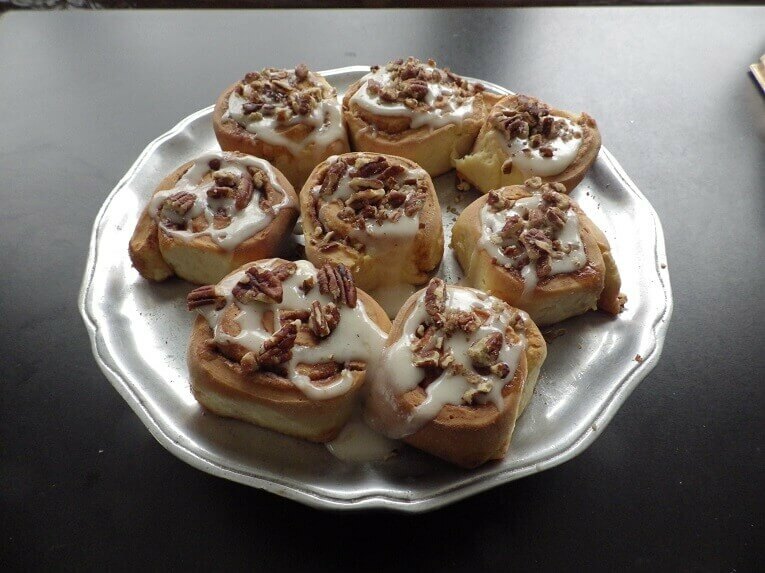 In a small bowl, stir together brown sugar, cinnamon, and pecans. Sprinkle brown sugar mixture over dough. Roll up dough, beginning with long side. Slice into 12 to 16 halt to one-inch slices; place in prepared pan. 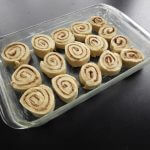 Let rolls rise in a warm place until doubled, about 45 minutes. 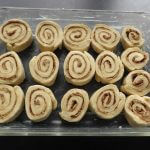 The easiest way to do this is to cut the long, rolled up dough in half and divide those pieces in half until you have the number of rolls that you want. 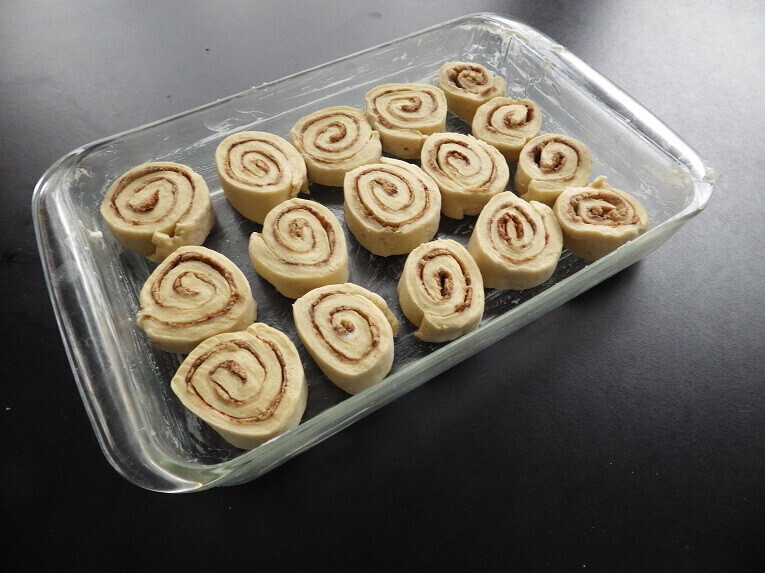 Place the rolls in the baking pan on their sides and tuck them together. Add the powdered sugar to a bowl and drizzle in the water and whisk until creamy and smooth. You may need to add more water or powdered sugar as you go, but do so sparingly. Add the cream cheese and the butter and either use an egg-beater to finish the glaze or add the powdered sugar/water blend to a bowl for a countertop mixer. Continue to assess the glaze as you go. Remember, you’re going to be adding some milk at the end so don’t overreact if it appears a bit dry. Add the vanilla and incorporate. Slowly add the milk and assess the glaze. If it’s too loose, add some more powdered sugar. If it’s too dry, add more milk a few drops at a time. You want a thick, milky white glaze. 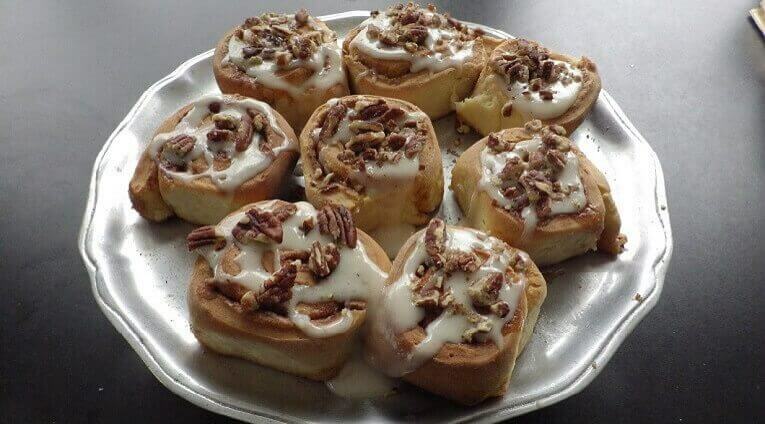 When you remove the cinnamon rolls from the oven, let them rest until warm and spread with the glaze. Serve.